Can you tell I'm smiling over here? The weather has turned the corner (I hope), my taxes are filed, my busy work season is done, and I have time to read and cook and walk and take photos. Ahhhhh. Let the stress go! This week I want to share some winning dinners I've made in the last month or so: two chicken and one meat. (If you're not a meat eater, you could try subbing tempeh, mushrooms, or tofu -- or just leave the meat substitute out completely.) All three are on our make-again list and appear on my Recipes: Tried and Liked board over at Pinterest. These were weekday dinners for me because they could be made in under an hour. 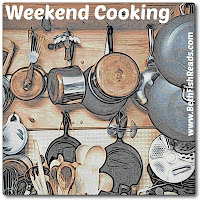 Be sure to check out my notes so you see where I strayed off the recipes. King Ranch Chicken and Quinoa Casserole: This was really good and easy to put together. I made the quinoa in my rice cooker, so I didn't have to watch it. The recipe calls for cooked chicken breast from a rotisserie chicken, but I used leftovers from a chicken I roasted earlier in the week. I don't like the taste of low-fat cheese, and I don't think it melts right, so we used white, full-fat Cheddar. Finally, I didn't bother with step 1, which called for toasting the quinoa. I didn't see the point because it was going to be layered in the casserole, which would soften it back up. I thought the 8x8 pan was really full (probably because I had extra chicken), so next time I'm going use a 9x9 pan. 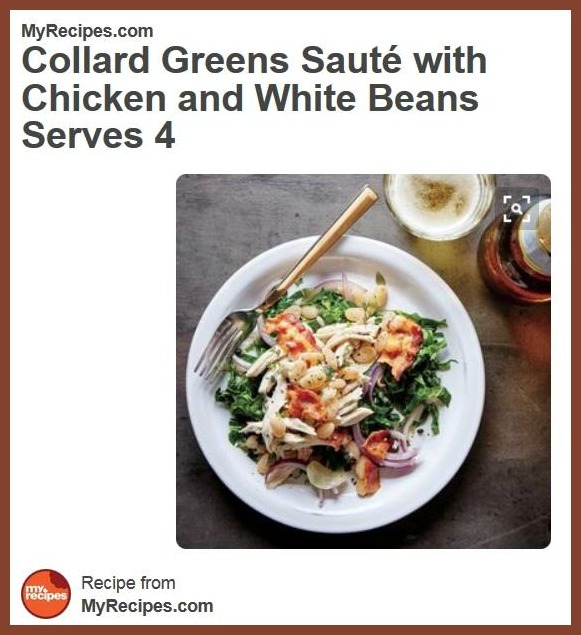 Collard Greens Saute with Chicken and White Beans: This cooked up in no time, and I bet it would be good with any sturdy greens, so if you prefer kale or chard, go for it! You may notice a trend here--again, although the recipe called for cooked chicken breast from a rotisserie chicken, I used the leftovers from a roasted chicken I made at home. Apparently this dish was developed in conjunction with a shrimp recipe, so I had to make a couple of other changes. I used canned white beans, and instead of leftover cooking liquid, I used low-sodium chicken broth. I know people commonly use sugar when they cook collards, but I left it out and we didn't miss it. 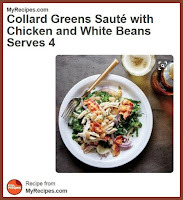 I made one change to the directions: At the end, I added the chicken mixture to the pan with the collards and heated it all through before sprinkling with the bacon. 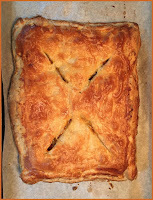 Italian Slab Pie: Okay, so I had never heard of a slab pie before, but sausage & puff pastry? Yeah, I was giving this a try. The recipe calls for jarred marinara sauce, but I used salt-free tomato sauce and added my own seasonings (basil, oregano, salt, pepper, and whatever else caught my eye). I couldn't find fresh basil at the store (grrrr) so I just sprinkled on dried. Other than that, I followed the recipe exactly. (I know! Don't fall over in a faint!) This was fabulous, and I will be making it again. I can see changing around the ground meat and flavorings for all kinds of different dinners: Lamb, Greek seasonings, and feta? Pork, Southwestern flavors, and queso? I don't know, I have to think on this. The only thing I would do differently next time is to blot the sausage really well to eliminate the extra grease/fat. The photo for this is my own -- doesn't it look beautiful? Hope one these sounds good to you! And if you have interesting ways to use up leftover roast chicken, be sure to let me know. The "slab pie" sounds delicious. I wonder if it ever goes by another name. I like the way you can redo almost every ingredient in the other recipes and get something good -- shows how much cooking is a craft. The slab pie has my complete attention! These all sound good and I agree with all your changes. I don't mind rotisserie chicken if I'm away but they tend to overpower the skin with rubs. Bought sausages at the market yesterday. some of the chorizo is slated for a company dinner tomorrow and the hot Italian will be the appetizer, but there will be some left to try in that pie. I bought a fresh basil plant this week, so the kitchen smells mice. The weather turned a corner yesterday here, actually felt like spring!!!! I love anything with collard greens and that slab pie looks to die for. 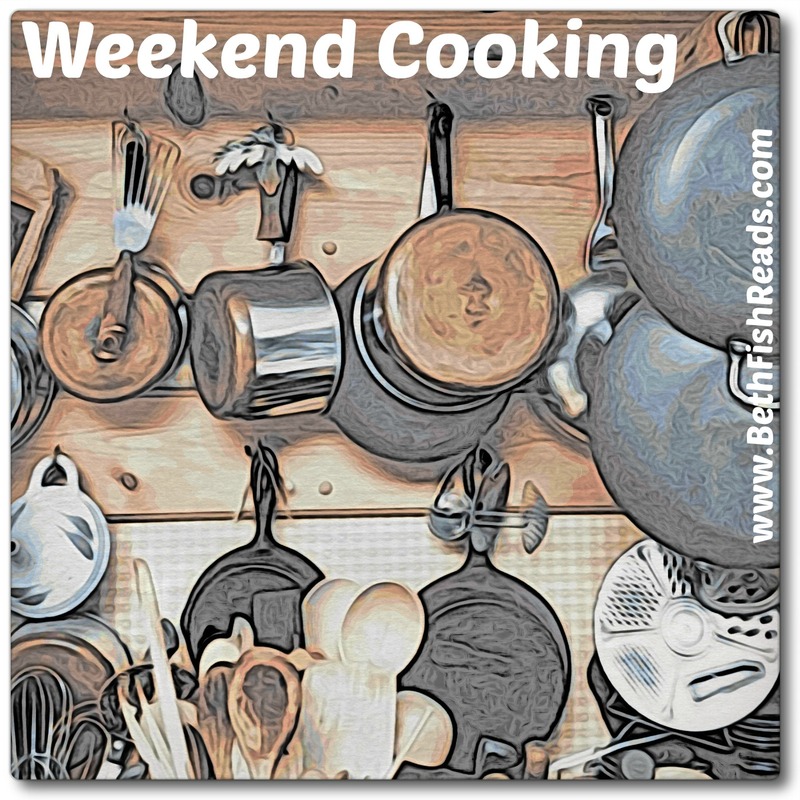 It's been a while since did a Weekend Cooking post and I've missed it, though I still check in every weekend to see what folks are doing. 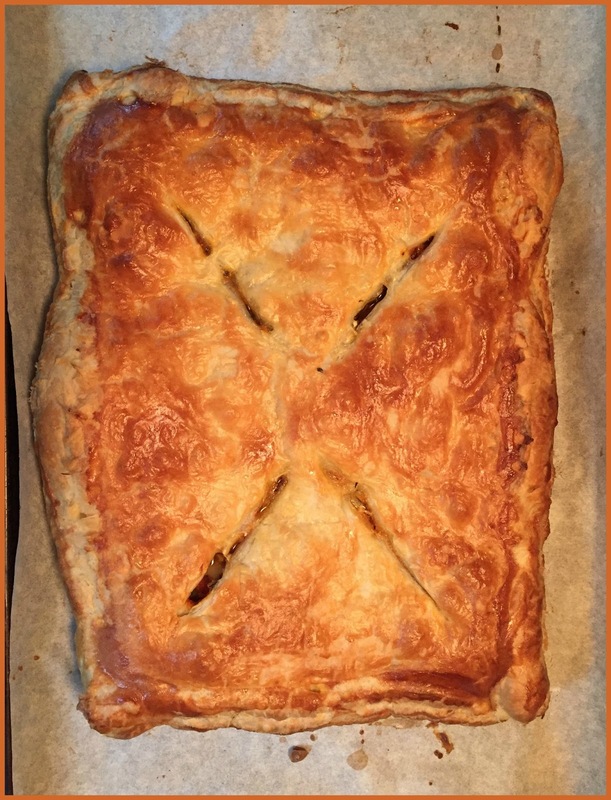 The slab pie looks and sound delicious, and is something I would probably make - after all, sausage and puff pastry - I totally agree with you - gotta be done! My family would be all about that slab pie. It looks so lovely, too. Glad to hear you are enjoying the season and getting to relax a bit. ;-) Looks like three delicious meals. The crust on the slab pie looks so golden brown and delectable. Nice work! I'm with everyone else: the slab pie sounds sinfully delicious. Gorgeous photo! Truly three delicious meals! And I'm always doing that too, subbing in this and that, especially the roast chicken, which I did on today's post. Want to try that slab pie soon. They all look good! I've never heard of slab pie either. I love the suggested variations for Italian slab pie! 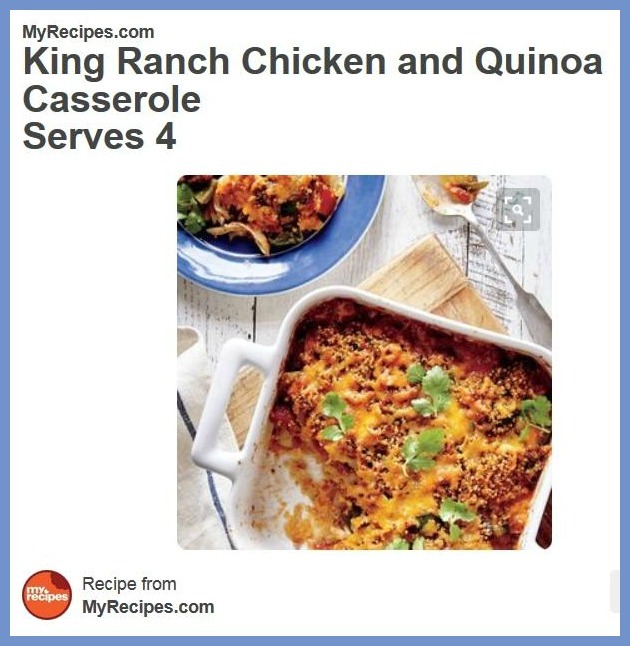 And I have a King Ranch casserole planned for the upcoming weeks - although mine is the 1990s version with corn tortillas and no quinoa. This one sounds more healthy. I hate low fat cheese! Not worth it, in my opinion! That slab pie sounds and looks amazing!! And also I learnt something else new - that you can cook quinoa in the rice cooker! The chicken and quinoa casserole looks great. Do you think leftover turkey would work just as well as chicken? Your slab bread is new to me. It really looks and sounds yummy.